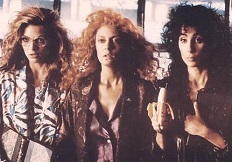 Adapted from John Updike's novel, The Witches of Eastwick is a peculiar mishmash of small-town social satire, Faustian morality story and old-fashioned gross-out horror. Susan Sarandon, Michelle Pfeiffer and Cher play three bored New England women, each recently divorced, who decide to conjure up the perfect man with the help of a little black magic. But the plan backfires when a certain Daryl Van Horne turns up in their small community of Eastwick. 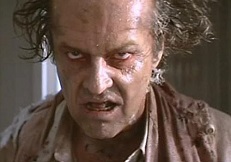 He's played by Jack Nicholson, eyebrows perennially arched… and he happens to be the Devil. Directed by Mad Max helmer George Miller, there's no denying that The Witches of Eastwick gains a lot of mileage out of Nicholson's diabolically entertaining performance, although it's not too much of a stretch to suggest that he's essentially playing himself. One of the film's greatest pleasures comes in the unexpected form of composer John Williams, not often associated with movies such as this, but whose music is a dark-hued delight from start to finish. Williams' score was the recipient of one of the film's two Oscar nominations in 1987, the other going to the sound design. Although it's tempting to associate Williams predominately with rousing blockbusters directed by Steven Spielberg and George Lucas, he has shown an underrated flair for the dramatic throughout his career. He's occasionally stepped into the horror arena (1979's Dracula has a darkly romantic score) and his works for director Oliver Stone (Born on the Fourth of July; JFK, Nixon) feature plenty of brooding, challenging moments. Indeed, many of his scores for Steven Spielberg feature horrifying sections – Jaws, Close Encounters of the Third Kind, Jurassic Park and especially War of the Worlds all feature their fair share of scary material. 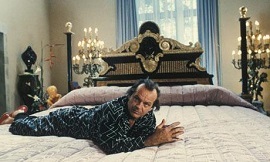 So on reflection, Williams isn't all that surprising a choice of composer for The Witches of Eastwick. But the darkness of the score is largely tempered with a breezy sense of wit; few of Williams' scores are composed with such a gleeful sense of mischievous fun. The centrepiece is the absolutely wonderful "Dance of the Witches", one of the least heralded yet brilliant themes of this composer's illustrious career. A devilishly malevolent yet whimsical piece for airy woodwinds and fiddles, with a prominent synth undercurrent (unusual for this composer), it eventual builds into grandiose proportions befitting Nicholson's Lord of Darkness and the three empowered witches at the heart of the story. The second track, the charming "The Township of Eastwick", in fact opens the film and is one of those effortlessly graceful string-led scherzos (again with added synths) that's brilliantly evocative of American suburbia. There are even undertones of Williams' friend Jerry Goldsmith's scores for director Joe Dante. The upfront nature of the electronics in the score as a whole may surprise those listeners more accustomed to Williams in lavishly old-fashioned mode. But although Williams' synthetic composing is less accomplished than that of Goldsmith, in this particular score it adds an intriguing extra dimension – after all, it's essentially a film about contemporary female empowerment, and the composer's concession to (then) modern musical trends makes sense on a textural level. That said, Williams' effortlessly classy and graceful touch with the orchestra pervades the entire score. It takes a particular set of skills to score a film like The Witches of Eastwick in such a sophisticated way, but Williams manages it. The third track "Maleficio" takes the music in a darker direction, wavering strings and wind effects recalling the edgier sections of the Indiana Jones movies. Even so, the clarity of the orchestrations and the intelligent musical touches are characteristic of Williams' intelligent approach (harpsichord passages lending a splendidly decadent touch). The harpsichord is present again at the start of "The Seduction of Alex" before sneaky, wavering strings build into a glorious statement for full orchestra as Cher becomes the first of the witches to succumb to Nicholson's supernatural charms. A deconstructed variation on the main theme is present in "Daryl's Secrets", the piece floating between hooting woodwinds, tinkling synths and comical sounding tuba arrangements. Eventually however, the piece picks up speed and urgency, the strings darting hither and thither in Williams' typically spellbinding style. A beautiful wavering flute solo begins "The Seduction of Suki & the Ballroom Scene", at once romantic and mysterious before Williams adds on more layers of the orchestra to embody Daryl's dark powers. The track is probably the most attractive in the score, the heavenly piano/string arrangement midway through worthy of any straight-laced romantic drama (although the scene itself ended up being tracked with "Nessun Dorma" instead). It's rapturous, sumptuous stuff, Williams at his very best. It's then back to fun and games in "Daryl Arrives" (which, chronologically speaking, should come at the start of the soundtrack), the witty and spirited main theme introduced on throbbing brasses and synths before the winds and strings pick it up. Something wicked this way comes, indeed. "The Tennis Game" is one of the score's most enchanting moments, a quaint little motif passed between piano, winds and strings that perfectly encapsulates the mood of its given scene. However, the lightness doesn't last long. It's back to a comical sense of horror in "Have Another Cherry!" as Williams scores the film's most repellent and notorious scene – a projectile vomiting curse inflicted on devoutly religious townswoman Felicia (Veronica Cartwright), who can see Daryl for who he really is. The composer introduces a turbulent little motif that churns beneath some creepy high-register strings before it builds into an uncomfortable finale for harsh brass and metallic percussion, Williams adding a touch of class to the nauseating sequence as only he could. "Daryl Rejected" begins with a darkly attractive piano solo before further layers of electronics and the swirling strains of the main theme conjure up a bewitching atmosphere. "The Dance of the Witches" piece gets an even more memorable airing in "The Ride Home", Williams embellishing it with some brilliantly rambunctious writing for brass and timpani. The grandiose climax then plays out in "The Destruction of Daryl", the composer's familiar fantasy writing coming to the fore with dramatic statements from strings, organ, cymbals and brass, all the more effective in depicting the showdown between Daryl and his witches coven. 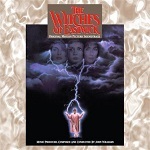 The deceptively twinkly, synth-led variation on the main theme in "Children's Carousel" then leads into one final treat in the concluding reprise of "The Dance of the Witches", ending the score on the same infectious note with which it began. Although The Witches of Eastwick is hardly as substantial or robust as John Williams' sweeping blockbuster scores, it does demonstrate the composer's delightful sense of humour and, more crucially, his versatility. It's tempting to pigeonhole this most famous of film composers as the go-to guy for space operas and adventures involving a certain Fedora-hatted hero; but in this instance, Williams is simply out to have fun, capturing the offbeat atmosphere of the film with wicked aplomb. The music's success resides in being both amusing and creepy at the same time – in fact, Williams could be said to have honed the Danny Elfman musical sound a good year before Elfman became widely known with the likes of Beetlejuice. 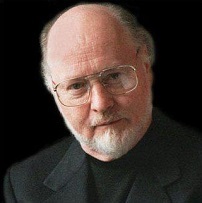 The seeds of many of Williams' subsequent works can also be heard taking shape in The Witches of Eastwick – the delightful interaction between strings and winds was to have a considerable influence on the Home Alone and Harry Potter scores in particular. On listening to the soundtrack, one can sense the massive smile the composer must have had on his face when underscoring scenes of Nicholson unleashing his inner horny devil. It's an overlooked treasure in one of the most remarkable film score careers of all time. The score is available as both a CD release and MP3 album, via these links at Amazon.co.uk and Amazon.com. There is also a rare expanded edition (see cover below) which if you are lucky may be found at these links at Amazon.co.uk and Amazon.com.